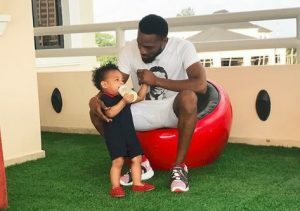 Nigerian star D’banj and his wife Lineo Didi Kilgrow are mourning the death of their 13-months-old son, Daniel Oyebanjo III, who died in an apparent drowning accident on Sunday June 24, according to reports. According to Pulse Nigeria the incident happened on Sunday at D’banj’s Ikoyi residence. D’banj and Lineo tied the knot in 2016 and had their son soon after. Daniel’s death comes just after his one-year-old birthday party which was held in May. The Fall In Love hitmaker is currently in America for the BET Awards and posted a black photo on his Instagram page with the heartbreaking caption. The news of the child’s death left many in shock and has seen many reach out to the star and his wife.